Under the two “Productivity Return” boxes to the right, list the factors in the initiative that will give low or high return in terms of your expected productivity gains. Step 3: Assess the strength of each list that presents the strongest business case. If the initiative indicates the ease and cost of implementation is positive and the productivity return you’ll experience I high (in the upper right-hand quadrant), the initiative is a good one to initiate. 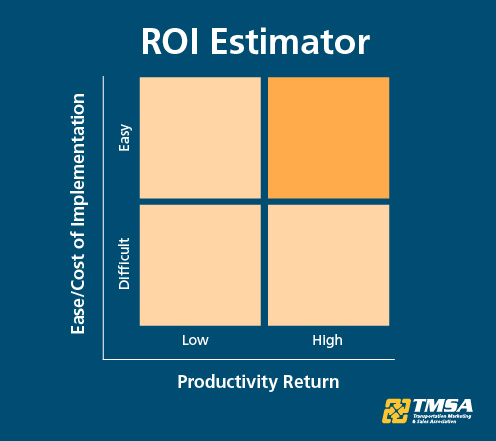 This practical process on how to assess the return on investment of your project is brought to you by Brian Everett, CEO of the Transportation Marketing & Sales Association. Comments on "How to Assess ROI of Project Implementation"